One of the most important things for maintaining good finances in marriage is a plan that includes differences. Making a financial plan together is important, but it’s also important to consider that you are two different people and this will require a good discussion about priorities and compromising on what you find most important. Things also change as time goes on. This discussion needs to happen frequently. Mr. T and I have always been good at making sure we’re on the same page. I do sometimes worry, however, as the outspoken one around here, that maybe he’s just going along with what I say because I say it (he’s a man of few words). Since this year we embarked on our plan to reach early retirement and we’re also approaching our tenth wedding anniversary, I’ve been looking for a new way to discuss priorities and finances as a couple. Funny that on paper, he seems to be the long-winded one. I wrote simply: Family, Health, Travel, Church. Paying off the mortgage on our house – Hilarious that we both even put this as number 2 on our lists. Pretty self explanatory. We want to pay it off early and we want to aim for a December 2018 payoff. Retire Early vs. Develop a Market for Personal Work and Become Self-Employed – This was a great discussion to have because our early retirement journey began with planning an escape for Mr. T from his current job. Mr. T and I are project people, as we’ve said before, and Mr. T is an artist. He hopes to be able to spend time doing the projects he wants both artistically (“personal work”) and not (“self-employed”). 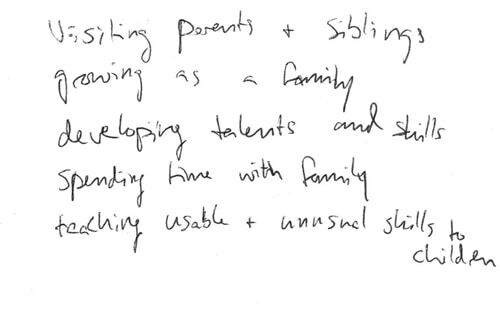 He only wants to work on things he is interested in doing, and he doesn’t want to risk the family finances on doing so. Maybe our “early retirement” is closer to just basic “financial independence,” or put more specifically by Mr. & Mrs. Slowly Sipping Coffee, a “fully funded lifestyle change.” Mr. T feels uncomfortable selling his art. He doesn’t want it to turn into a “job” and it’s always awkward selling stuff you made. But ultimately, he would like to find something that he likes to create that people like to buy. 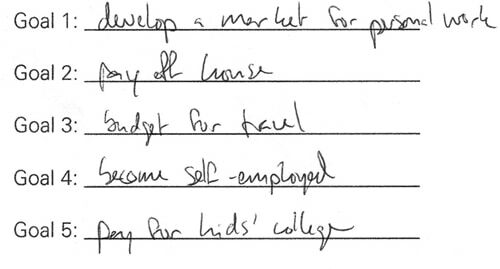 His desire to “become self-employed” is more broad. Mr.T’s hoping we’ll actually earn some income on some of our many projects (art included). 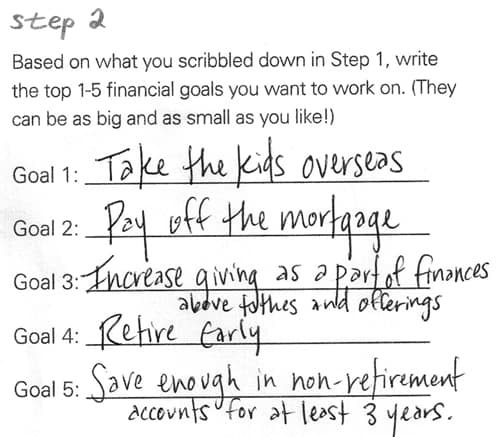 My part of the plan is to get the finances in order (I’m the one that geeks out about the numbers) for us to be able to retire early (by definition: never having to work again) and start something new (many of our ideas are more philanthropic than money-making). My goal to “save enough in non-retirement accounts for at least 3 years” is what will allow us to start our own thing. That’s our seed money. And if we don’t get any of it back, that’s okay. We’ll just make sure we feel good about where it went (ie: philanthropy). Mr. T’s “Pay for Kids’ College” – This is also a priority for me, but I didn’t know how to phrase it because we still haven’t quite decided how we want to go about doing this. Both of our parents had different tactics about this and we like them both. Mr. T’s parents paid for half of his undergraduate college tuition until he graduated. Pros: the amount of money wasn’t tied to tuition rates and Mr. T had incentive to get scholarships and go to a cheaper school to help with his half. Cons: Mr. T was never sure what the end date of this deal was. Because they never explicitly told him that they would continue this until he graduated (which they did end up doing), he wasn’t ever sure if his allotment of money had run out or if they would cut him off when we got married. Both of our fathers are small-business owners and both of us worked at “the office” through high school to help pay for college. Instead of rationing my money out, my father just set it up in one checking account and my senior year, he told me about it and had me track all my debit card purchases in a checkbook register. He made it clear that the account was my college money and costs above that would be my responsibility. The account was enough to fund about two years of a cheaper university. Pros: I had to learn how to manage money, I had to hustle to pay for the last two years of undergrad and all of my graduate school costs, and the terms were clear (I knew I wasn’t getting any more money). Cons: If we have a kid that is terrible with money, how can we trust them not to just squander it all on something dumb. I like the idea of giving the kids freedom, but not too much freedom. Our Conclusion: Save money for the kids in our accounts and figure out how we want to disperse it later. We are agreed that we only want to fund about half of their schooling. My: “Increase giving as a part of finances above tithes and offerings” – We already pay a tithing of a tenth of our increase and make other donations on top of that. My goal is less about money and more about the mindset of giving. I want to work toward something that makes a difference in someone’s life and teach my children that helping others is the biggest priority. Mr. T agrees here and, as I mentioned before, a lot of our future entrepreneurial plans are philanthropic (based in Cambodia, specifically). Mr. T didn’t put this on his list because as we’re in the “wealth accumulation” phase, we don’t have as much time to devote to starting something up in another country (or as much time or flexibility to travel there). I agree. Conclusions: Right now, we don’t need to budget for this above the “save enough in non-retirement accounts for at least 3 years” goal that will fund these projects later. After our awesome discussion, we moved on to parts 3 and 4 that have you look at how much money you are putting toward each goal every month and asking yourself if it’s enough and then making specific budget changes if you determine it is not. I recommend every individual and couple fill out this worksheet. As a couple, it was an awesome exercise to make sure our finances were aligned with our priorities as well as ensuring that we were on the same page with priorities. Challenge: fill it out and let me know what you write down! No all week – traveling. Picking back up Monday! This is my kind of date night!! Also, I think it’s absolutely hilarious how you said “I have an idea and you’re going to hate it” vs. hitting him with the “surprise!” – I legitimately laughed out loud!! My fiancé and I have done small exercises like this, but they’ve never been completely organized with full worksheets. I love Cait’s work, so I think this is definitely something we need to take on! Especially considering after the wedding next year, different financial goals may arise. 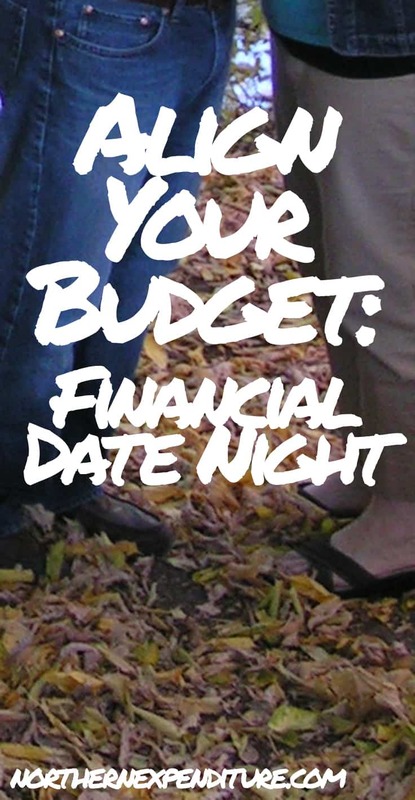 Thanks for sharing your financial date night! It’s my kind of date night as well! I think I’ll do it quarterly, or at least annually (it’s not really Mr.T’s favorite!). Isn’t Cait’s stuff so great? This worksheet is fantastic! That’s still more fun than the “Let’s review our estate plan!” date night I sprung on Mr. ONL a few weeks ago. 🙂 I love that you’re planning to pay for half of your kids’ college, btw. Knowing that I wasn’t getting my full college paid for motivated me to work hard and earn a full ride, and even then I still had to take out about $10K in loans because I went to school in a super high cost of living area. But paying back those loans was a super valuable experience, too, in terms of learning about my money priorities and that I hate debt! Ok, Mr.T sounds like the cutest ever. Also, your goals are so wonderful. I have just become inspired to do this with my fiancé and see what we come up with. Although we can’t go as far as self-employment or early retirement, it is still a great opportunity to plan. So excited to watch your journey through 2016! Good luck.